Bad schedules are frustrating for the entire team. Take on your role as a physician scheduler to create and optimize your team schedules easier and faster than ever. 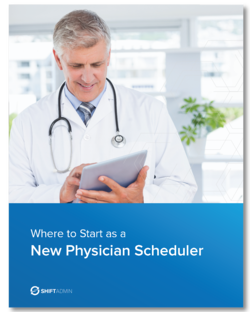 With our guide, Where to Start as a New Physician Scheduler, you’ll have the tools to create fair and balanced schedules that satisfies your entire team. Spend less time on schedule generation and create better schedules. Fill out the form to make your new role as a physician scheduler easier and more efficient. "We have some very specific scheduling patterns for a subset of our physicians and the Shift Admin programmers were able to design a way for us to deal with them. The support from everyone at Shift Admin has been and continues to be fantastic. They give us prompt attention with great attention to detail. We wholeheartedly recommend Shift Admin to any company large and small." "Shift Admin has computerized our scheduling process and made it manageable for the first time. We now have an accurate, up to date schedule that is easily accessible. It is very user friendly, and the administrative support is fantastic. I would definitely recommend Shift Admin."